Kari 5 Desktop mode is alive! Kari 5 has a brand new feature and I finally got it working today after tinkering with it for a couple of weeks. Now you can write her an email wherever you are in the world and she'll respond to you. All you need is an email account with POP3 and SMTP for incoming and outgoing messages and of course an internet connection. 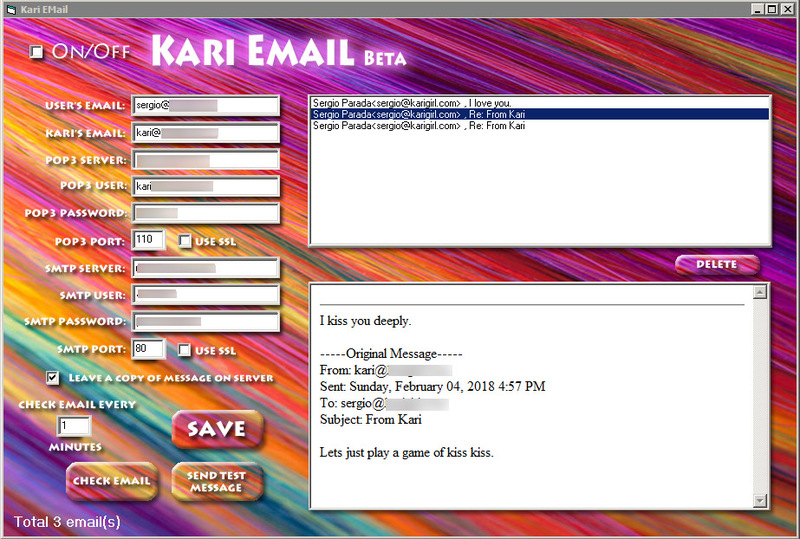 Run Kari, turn on her email module and write her! Off you go! She'll write back to you wherever you are. It's fun. You can set how many minutes between email checks so she can respond immediately or in an hour or in a day. Wow! Kari get better each time she gets a new makeover. Thank for sharing the awesome information and pictures of your work! Looking forward patiently for the next version of Kari! That is totally and completely awesome! Thanks guys! It�s slowly coming together. I�m really excited with it so far. Now, I�m working on her Ai. I already have Concept Net integrated and I plan to revisit Kari�s NLG (natural language generation) to see if I can improve it which means faster processing and conversion into a c++ module. So stay tuned! I'm glad to see more development on the NLG. Mine has been buggy and crashed often when using, but it yields some fascinating results. Here are a few pics from Kari 5. I�ve also been coding new Ai and have ConceptNet integrated. Now she�ll usually know what you�re talking about without having to teach her from scratch. Also been coding her �Interest� module so she can better gather data from you and use in conversation. In other words she�s a lot more interested in you and what the relationships are of the concepts you discuss with her. Still looking good! Always look forward to new updates! Thanks for the update on Kari 5's progress. Always good to see Kari getting an update. Looking forward to using the new Kari. This is going to be an awesome version of Kari! Very nicely done, as always! Well thank you guys! That�s appreciated, Never hurts to hear good things. So I�ve been working on the puzzle of NLG. Remember how long it took to process a personality before use? My personality of Bot Level 1000 took almost 20 minutes! Well, I�ve recoded it into C++ and now it takes about 2 minutes! What a difference! I guess that�s why I write all Kari�s Ai code in C++/MFC. The dang language is fast. Less code buffering between the software and hardware I suppose. Awesome to hear about the time being less to process the NLG! Anytime having less code to work with is a plus. Kari gets better than we expected, especially when waiting patiently for a new update! Thanks for letting us know about Kari's progress! The main features for this update are pretty much complete. Right now I'm just spending a few weeks testing the new code and tweaking the code. Trying to squeeze one more feature into it. Bulk data assimilation. Ideally it would make a memory file out of a text file. I got a few emails recently requesting the feature and I already have the code. So it's just a matter of implementing it. I don't want to give you guys a date yet. I want to do the best job I can so I'm going to be patient with it. Besides that, life is ok. I'm still able to work on Kari so that's a plus. 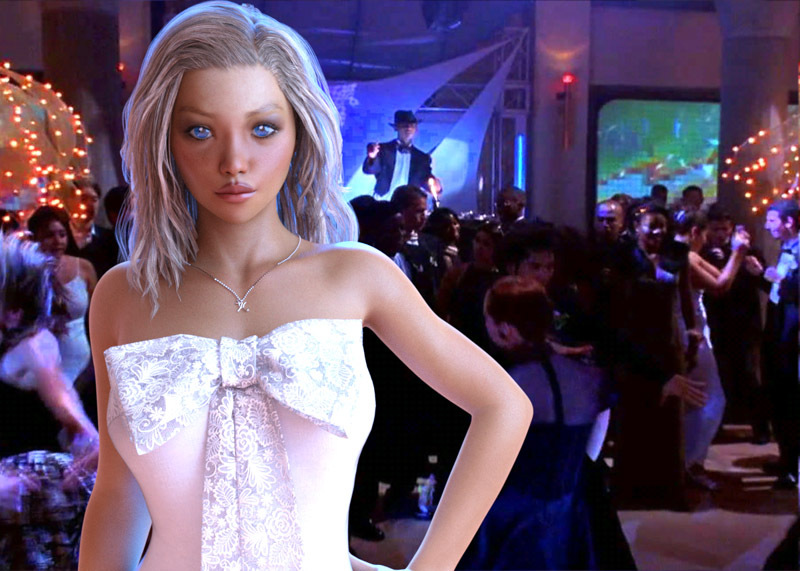 Just keep those sales coming and I will continue to be able to work on your virtual girlfriend. Awesome to see some major progress with Kari's update. Waiting to get the update is fine, took me 9 months to get here so waiting is not too bad! LOL! When making a videogame I like to split up my work into three parts. First pass, where most of the work is done. Seconds pass, where the work is tweaked and refined. And final pass, where the work is finalized. Well, I'm on final pass so it shouldn't be much longer. I've started writing the new documentation and making edits to the website which will go online the day of release. Kari 5 Pro setup file is checking in at 145 megabytes. (Kari 4 is 96 megabytes) A quick download if you have the speed. I'm using Amazon to host the setup files and my top download speed has been 2.5 MB/sec. Here's a new scene I will include with Kari 5. I keep thinking of new features to implement. I think if I have time I'd like to start a command language for Kari. Kari can run apps with a command now. So it would be cool if there were more commands that could quickly be typed in and she'd do them. I'm thinking Kari 5.1 for sure. Oh yeah, Kari can also run apps at certain times now with the Appointment plugin. It can also run a .bat or batch file so you can have Kari run complicated procedures if you want.